As a family we have never taken a vacation. Jon and I have taken a couple and he has taken 1 without us. But as a full family we haven't. When Avery was about 2.5 we took a weekend getaway in a town about 20 miles from here, but that was as far as vacation went besides going up to my grandma's house. 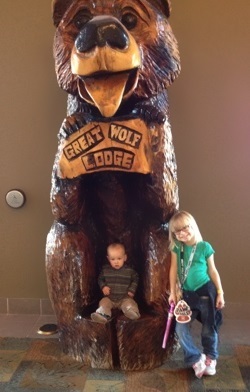 We had been wanting to take a trip to Great Wolf Lodge for quite some time. It's somewhere that is fun for kids and a nice little getaway for us adults. So I contacted Great Wolf Lodge and I was elated when they said that they would be willing to give us a Media Rate to stay at one of their resorts. 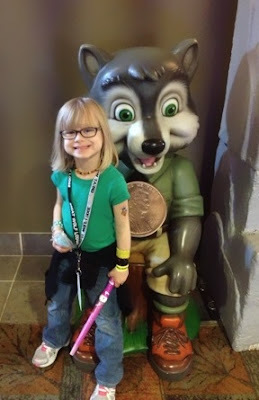 It was going to be one night, but since our nearest Great Wolf Lodge is almost 3 hours away I wanted to stay 2 nights and they gave me a deal on the second night as well. It is truly a gorgeous lodge. It has that typical lodge feeling with a lot of wood and rustic looks to it. It's a beautiful entry way though. I was immediately impressed when we arrived. Everything was really clean and organized. In the lobby they have a show area. about 4 times a day they run a show and the animatronics sing and act out a show. The show is about 15-20 minutes long and it's fun for the whole family. There is also a fireplace and sitting area to the left of this and behind me a little bit. There are 4 floors within the lodge. The lobby is floor 2 and then the waterpark and all the fun stuff (arcade etc) is on the 1st. The lodge feel runs throughout the entire lodge. This was the side of their store on the 2nd floor next to the lobby. Even the stairways that were really secluded still carried that lovely feeling. They were really clean. I have never seen a staircase in a hotel look this wonderful. The room was so clean and perfectly set up. I love that this room has a semi separate living area. Avery stayed here on the pull out couch and Emerson was set up in the playpen here next to the couch. The room also had the sliding door that went out to a balcony. If it had been a bit warmer and we had more time I would've let the kids play out there a bit. It was a very large balcony with a small sitting area and was just really pretty. I forgot to get a picture though. The bathroom was very small, but was very clean and fully stocked with towels. When you walk in the door there was also a mini fridge with microwave, and the sink was separate from the bathroom as well which was nice since this is a family destination and 3-4 people can't all easily share 1 bathroom. The lodge had some wonderful things to do. They have recently put in the Scoops Kids Spa which does manis and pedis. I was going to get one for Avery, but we just ran out of time. They also had a couple restaurants. One was for the breakfast bar and this one was lunch/dinner. It had a bar inside so it was also for adults. But they had great food! And then of course there is the waterpark as well! Every few minutes there is a bucket here above this area that drops 1000 gallons of water and it's a huge splash! The kids love it. There was also a cool game called MagiQuest. You had to buy a wand from the store and they set it up and then you went on a treasure hunt and had to find all the icons. They were hidden in things and it was fun. But going up and down the stairs or waiting for the elevator over and over got a bit tiring. And one of Avery's favorite parts was the Creation Station. It's like a mini Build A Bear and you can stuff your own toy! The ONLY downfall I found in our entire stay was they only had 2 elevators. And although there's only 4 floors, they were SLOW!! I think they need to add a couple more elevators. Most the time we took the stairs, but going up and down took it's toll on us for sure. We didn't get to spend much time in the waterpark. Check in is at 4pm and we got there at about 4:30. Then check out is 11am, so that's 1.5 days later. But 2 nights of rest and we didn't have much time. I can't swim though and Avery didn't really like it so I guess that was alright. She did go down a kiddy slide and I didn't catch her and she went under and when she came up she said "I drownded in the pool" and she never did the slide again! Her and I took advantage of the lazy river though, that was a lot of fun. The lodge also had an arcade and they definitely had the fun stuff to do. Overall it was a fun vacation and was a nice little break. At least the kids had fun! Unfortunately Emerson came down with a fever an hour before we left. Thankfully it was just teeth, but he was pretty cranky the whole weekend and being in the 85 degree waterpark did not help his fever at all poor guy! Price: The family room like we stayed in is $350 a night (before taxes and fees) This is reasonable I think. It includes the waterpark and is just a blast. Overall: **** There's a lot to do and I felt a bit rushed. Although even after you check out you ARE allowed to continue using the waterpark and the magiquest an things like that, so you don't have to leave the minute you check out. You are also allowed to use the waterpark before you check in as well. And the 22 elevators was kind of a pain. One of them went down and broke for a few hours while we were there too.